IC Insights recently released its new Global Wafer Capacity 2017-2021 report that provides in-depth detail, analyses, and forecasts for IC industry capacity by wafer size, by process geometry, by region, and by product type through 2021. 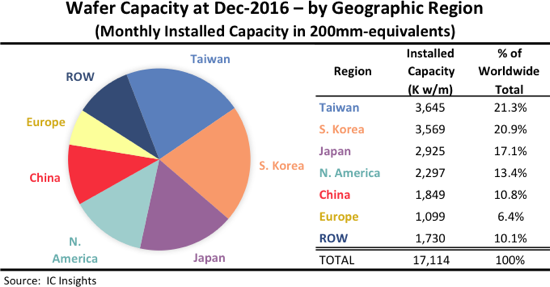 Figure 1 splits the world’s installed monthly wafer production capacity by geographic region (or country) as of December 2016. Each regional number is the total installed monthly capacity of fabs located in that region regardless of the headquarters location for the companies that own the fabs. For example, the wafer capacity that South Korea-based Samsung has installed in the U.S. is counted in the North America capacity total, not in the South Korea capacity total. The ROW “region” consists primarily of Singapore, Israel, and Malaysia, but also includes countries/regions such as Russia, Belarus, and Australia. As shown, Taiwan led all regions/countries in wafer capacity with 21.3% share, a slight decrease from 21.7% in 2015 when the country first became the global wafer capacity leader. Taiwan was only slightly ahead of South Korea, which was in second place. The Global Wafer Capacity report shows that South Korea accounted for 20.9% of global wafer capacity in 2016, slightly more than the 20.5% share it held in 2015. Two companies in Taiwan and two in South Korea accounted for the vast share of wafer fab capacity in each country. In Taiwan, TSMC and UMC held 73% of the country’s capacity while in South Korea, Samsung and SK Hynix represented 93% of the IC wafer capacity installed in 2016. Japan remained firmly in third place with just over 17% of global wafer fab capacity. Micron’s purchase of Elpida several years ago and other recent major changes in manufacturing strategies of companies in Japan, including Panasonic spinning off some of its fabs into separate companies, means that the top two companies (Toshiba and Renesas) accounted for 64% of that country’s wafer fab capacity in 2016. China showed the largest increase in global wafer capacity in 2016, rising 1.1 percentage points to 10.8% from 9.7% in 2015. China’s gained marketshare came mostly at the expense of North America’s share, which slipped 0.9 percentage points in 2016. With a lot of buzz circulating about new ventures and wafer fabs in China in the coming years, it will be interesting to watch how quickly China’s installed wafer capacity grows. It is worth noting that China first became a larger wafer capacity holder than Europe in 2010. The two companies with the largest portion of wafer fab capacity in China were SMIC and HuaHong Grace (including shares from joint ventures). In total, the top five wafer capacity leaders accounted for more than half of the IC industry’s wafer fab capacity, having increased from 2009, when the top five wafer capacity leaders accounted for approximately a third of global capacity.